Riggs on Eddie: "He kind of follows me around like Frankenstein's monster"
LONDON, England (CNN) -- His demonic face has stared maniacally from the cover of every Iron Maiden album since they released their first LP in 1980. Derek Riggs' favorite image of Eddie, as a clairvoyant, "because it's so completely manic." Edward T. Head, better known as Eddie, is a former theater mask who over 30 years has grown a body and morphed into the most recognized member of the band. In the Seventies, he was skull that sat above the drummer. "It had flashing red eyes and it would spew out this funny stuff and fake blood all over him," recalls drummer Nicko McBrain. When Iron Maiden released their first album in 1980 there was no doubt who would be on the cover -- Eddie, as drawn by British artist Derek Riggs. Here, he tells Revealed about the ghoul who made him famous. Derek Riggs: As soon as I had finished painting the first picture of Eddie I sat back in the chair and thought "that picture is going to make me rich and famous"... and then I thought "don't be silly" and went off to get a coffee. I showed the picture to my artist's agent who gave it back to me with a grimace and said "we don't think that picture is very commercial." I started showing my portfolio to the art directors of record companies who usually drew back in horror as soon as they saw it, one time an art director threw me out of his office because he didn't think it was a proper rock album cover. He pointed to a picture on the wall which was his idea of a rock album cover -- it was an airbrush drawing of a waitress in a short skirt bending over so you could see her knickers. Another record company art director suggested I go and get my hair cut and paint more normal things because I looked "like a weirdo, or a mental case", and I shouldn't go around painting things like that and I should get therapy. This story, and many others are covered at greater length in my book "Run for Cover, the Art of Derek Riggs." which is available exclusively from my Web site; derekriggs.com it also contains a lot of nice and nasty pictures. Do you feel a personal connection to Eddie, like he's your creation, almost your child? At times have you felt like a proud parent? Derek Riggs: I am not Eddie's parent, it's just a picture that I did one day and then kind of got stuck with. I never intended to be painting the bloody thing for twenty years. I didn't even want to paint horror, I was always more interested in science fiction but I couldn't paint the silly looking space ships. I used to paint really weird space ships (they're made by aliens aren't they?) and then the art directors would point to something painted by someone else and say "spaceships don't look like this ... they look like that" I soon realized that sci-fi illustration wasn't as creative or original as it looked from the outside. So I went off to try to do some album covers instead. Where did the inspiration come from for Eddie's various guises? Derek Riggs: The various looks of Eddie are often derived from the direction that the band wants to go in at the time. One year it was Egyptian, another year it was sci-fi, and so on. Usually the details of what came after was my doing. They just gave me a direction and then let me run with it. Most of the time the rest of the content was my idea, although sometimes they would have ideas for the actual content of a painting, like the piece of mind cover, which was Steve's idea. A lot of the other stuff, the detail and such, I used to make up as I went along. Sometimes I just got bored and changed him anyway, for something to do. What's your favorite depiction of Eddie and why? Derek Riggs: I like the clairvoyant because it's so completely manic. I didn't plan it like that, the song was about clairvoyance (seeing into the future.) I started out with an idea for something like the Roman God Janus who I think had two faces, and then I gave him three faces (past, present and future) but I couldn't reconcile his face when his mouth was open, so in desperation I rubbed out the bits between his lower and upper jaw (his cheeks) and it looked so mad that I left it like that. You've been quoted as saying that the design for Eddie was based on footage of a decapitated head you saw on a television documentary about the Battle of Guadalcanal in WW2. Is that correct? Derek Riggs: No, that is complete rubbish. I have not been quoted as saying that because I never said anything like it. It's a complete misquote. Also, from a factual point of view it's completely wrong. I wanted to paint a picture of a decaying, semi-skeletal figure in the streets of London. I needed some source material to draw from because I didn't really know how a human head decays. Then I remembered a photo-collage I had done in the 1970's when I was at school. Part of it was a photograph of a decaying head which had been stuck onto a tank. It came from Time magazine and it was captioned as being an American soldier's head which had been stuck onto a Vietnamese tank. Many years later I found the same picture in a collection of Time Photos. There it was captioned as being an English soldier's head stuck onto a Nazi tank. So now I kind of doubt that it was anything but a bit of war propaganda. Anyway, I used that picture as reference for painting the monsters head. Eddie was not inspired by the photo; I used the photo as reference for the painting. The painting was inspired by the English punk rock movement in the late 1970's. They had this kind of street philosophy about the youth of the time being wasted and thrown onto the garbage. It was an attempt to depict that idea visually. But I couldn't sell it to the punks, it scared them too much. Do you think he's aged well? Is the Eddie of today as powerful and compelling as those past? Derek Riggs: Only the ones which I paint. The ones by other people are a bit lame. They all talk like they can paint but when it comes down to it they fail. This is because they talk the talk, but I am the only one who can walk the walk. I have walked all the way out there and all the way back again and I'm still standing (but only just, and my feet are quite sore). My pictures have sold more merchandise than Walt Disney. One for one Eddie outsells Mickey Mouse. I have sold more posters than the U.S. president in an election year. A lot of the "original" fantasy ideas you see in the movies and on TV have been stolen directly from my Web site and my published works. I thought it up and someone else just stole it. I do get a bit tired of seeing my ideas used by other people who have no creativity of their own, just a big movie budget. Hey, give ME the big movie budget and see what happens. And stop pilfering from my Web site. Thieves. What is Eddie like, as a ghoul? Have you assigned a personality to him? Derek Riggs: Look, Eddie is a painting. He doesn't have a personality, he doesn't eat, doesn't sleep, doesn't growl or bite. He doesn't believe in anything, he is not for anything or against anything. He is a painting ... OK? What are some of the greatest misconceptions about Eddie? Derek Riggs: That he is a real person with a personality. That somehow I am like that, he is my alter ego. Well, he isn't. He is just a painting that I did one day and I kind of got stuck with. He kind of follows me around like Frankenstein's monster. And you think you've got trouble with stalkers. You stopped working for Iron Maiden some time ago. Was it hard letting go of your creation? 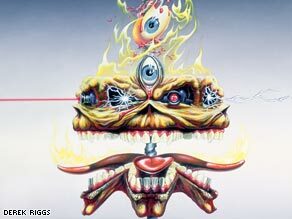 Derek Riggs: No, by the time I stopped working for Maiden I had had enough of painting Eddie anyway. I really wanted to do something else. I could have made a big fuss about the rights to the character but I didn't want to paint him any more and I couldn't use him for anything much anyway. Also, he was a part of Maiden's core business and it is not in my nature to do people damage in that way. So I put him down and walked away. I do a lot of walking. I have done a couple of pictures for them recently; they seem to be well received by the fans, so we'll see how things go from here. More walking I guess.